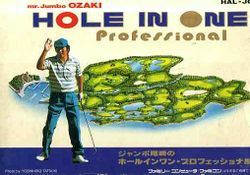 Jumbo Ozaki no Hole in One Professional (ジャンボ尾崎のホールインワン・プロフェッショナル, Jumbo Ozaki no Hole in One Professional? lit. Mr. Jumbo Ozaki's Hole in One Professional) is a golf game developed for the Famicom and published by HAL Laboratory in Japan on February 1, 1988. It was named after legendary Japanese golfer Jumbo Ozaki, who played golf on a professional basis from 1973 to 2002. Masashi Ozaki is often known as Jumbo Ozaki on account of his height and length of the tee. He has featured in the top ten of the Official World Golf Rankings. / : Press up or down to change your club selection. / : Press left or right to change your aim. : Press the A button to confirm selections, or to swing your club. : Press the B button to cancel selections, or to view the hole. : Press the Start button to begin a new game, or to view the score care mid-game. : Press the Select button to receive hints (displayed in Japanese). Stroke Play: A single player mode that allows you to practice on each hole in an effort to improve your ability. Match Play: A two player mode that allows players to compete for the best (lowest) score on a course. 1 Day Tournament: Enter your name and keep track of your performance against other computer controlled players. 4 Day Tournament: Similar to the 1 Day Tournament, only you must compete against computer controlled players for four days. Changing the difficulty setting will impact the strength of the wind that you encounter throughout play. This page was last edited on 11 July 2012, at 18:39.